Castor oil is often ignored because of its extremely thick and sticky consistency. However, if you want a cheap and natural remedy for several common hair and skin complaints, then castor oil should be your unambiguous choice. Castor oil is rich in ricinoleic acid. Ricinoleic acid is a very effective natural anti-bacterial and anti-fungal agent, which prevents fungus and bacteria from inhibiting hair growth. Castor oil is also very thick and helps to prevent hair loss by simply coating the hair strands and preventing them from falling out. it to deliver all the nourishment deep into the pores and follicles, thereby promoting hair growth. The oil is filled with essential nutrients like vitamin E, amino acids, and linoleic acid, which will help you put a stop to split ends and splintering. The oil will penetrate deep into your scalp and smoothen out the rough hair cuticles and prevent breakage. You have to spread the oil evenly on your hair and then wash it off after a few hours. 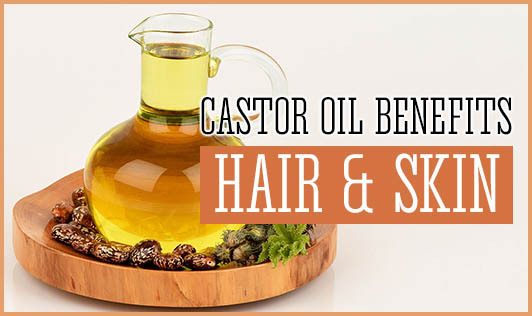 Castor oil has a high glossy nature and is a natural hair smoothening agent. So a little bit of oil is enough to add a lush shine to your hair. Just take about two drops of castor oil in your palm and rub it through the ends to make them smooth and glossy. Castor oil is very sticky, so if you use too much of it, it will make your hair very greasy and sticky. If you have been losing too much of hair and want to stop hair fall, you can use castor oil for scalp treatment. Mix the castor oil with some other form of lighter oil like coconut or olive oil, so that it spreads more evenly on the scalp. If you're just looking to thicken your hair at hairline, you can use pure castor oil, but application should be light. You can also apply the oil to your eyelashes to help thicken and strengthen them, and prevent thinning and shedding of eye lashes. Castor oil does wonders for keloid type of scars and other scars that involve a lot of hardened scar tissue. This is most probably due to its ability to penetrate deep through multiple skin layers. The oil softens the skin so much, that it breaks down deep scar tissue and smoothes it. Castor oil is also excellent for the lips. It not only smoothes the lips, but also helps you protect them due to the naturally thick and sticky nature. It doesn't budge without being wiped off deliberately. It also gives a natural shine to the lips, which improves both, the appearance, and the health of the lips. So forget all the costly chemical products out there and opt for this natural way to get long shiny hair and beautiful skin.